Master Chef Cambodia - Cooking School! 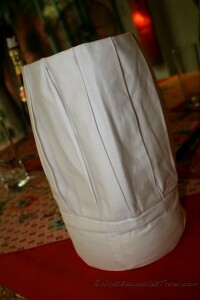 One of our favorite souvenirs of the countries we visit are RECIPES of their local dishes. Whether it’s lovo pig from Fiji or Nasi Goreng from Malaysia, it’s fun to re-create the memories of our time and have an opportunity to shop for new things to eat. And we get to share some of our favorites with you (see recipe below). 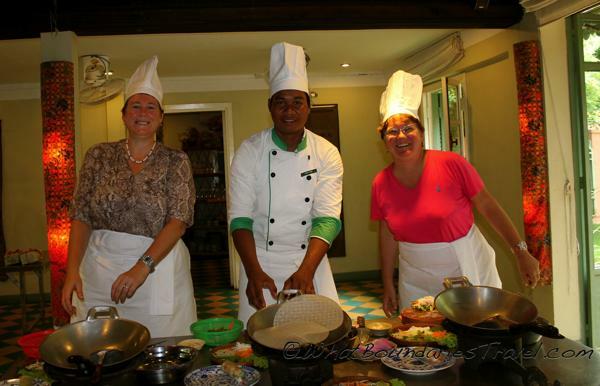 We decided on an afternoon class and arranged to meet our chef at the Champey Restaurant across from the Old Market. It was pouring rain, so we had a few minutes to admire the restaurant before heading off to the Market. I have to admit I typically love visiting local markets, but this one is not for the faint of heart (or stomach). The vendors, however, were incredibly nice and didn’t mind posing for my MANY pictures. Here you will see flopping fish, beheaded chickens and things that sometimes it’s just better not to know exist – like Durian Candy! 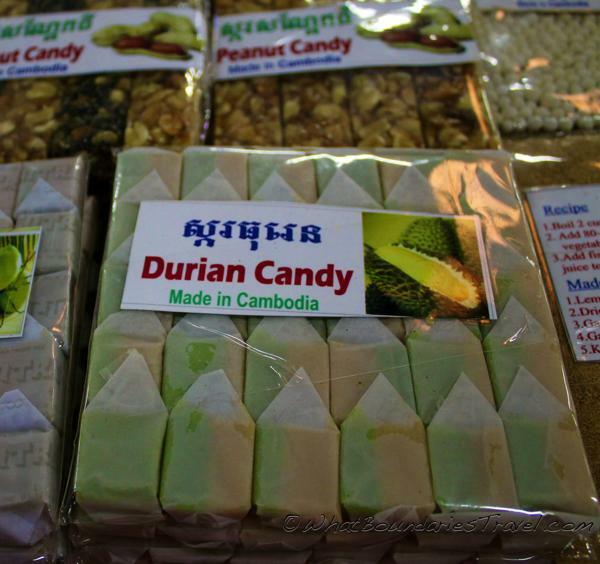 Not Sure About Durian Candy! 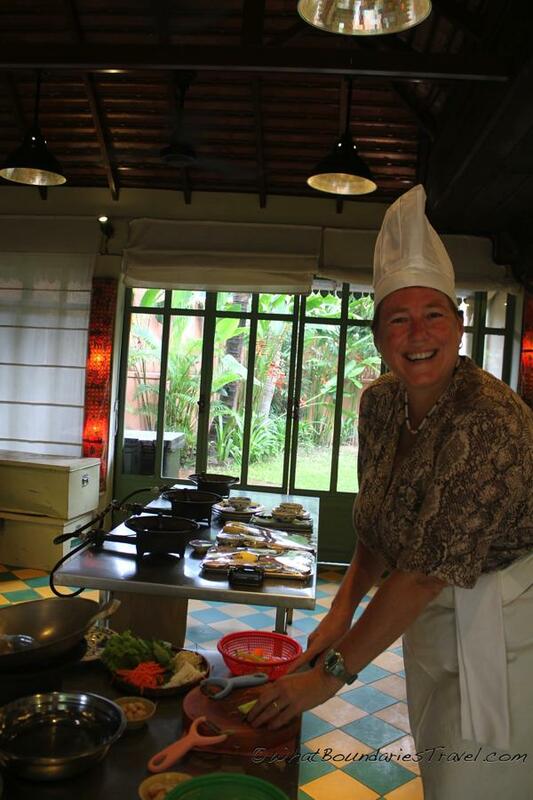 We left the market for a short walk to the country Khmer kitchen cottage. This delightful little house, complete with garden and terrace, looks like something out of storybook setting. 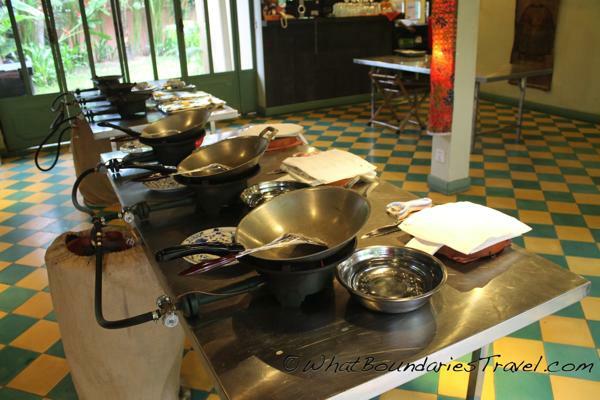 Here each person has their own cooking station, ingredients prepped and the tables nicely set for the much anticipated tasting. Drinks (beer, wine, tea, soft drinks) were available for addition purchase. These classes pride themselves on using Western standards of filtered water, pure ice and no glutamate (MSG) in their cooking. 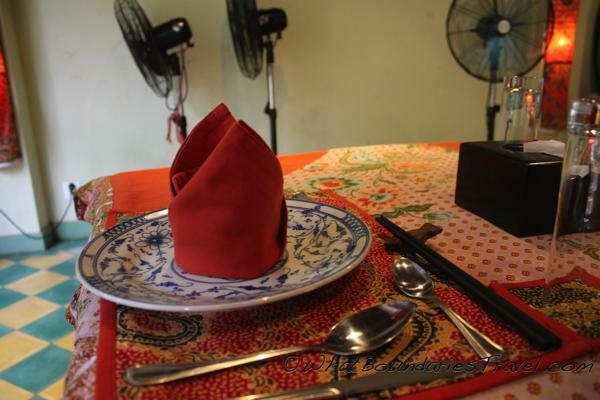 There were only the two of us with our chef and his attendant, but earlier in the week he explained that one of the classes numbered 21 people! Background music was a peppy mix of New Orleans jazz, so we felt right at home. 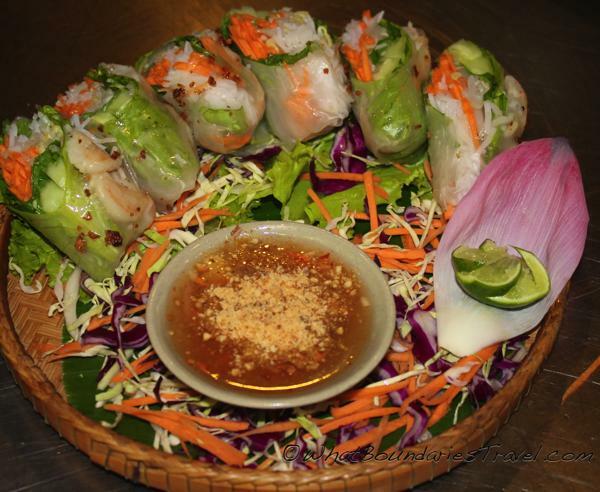 First Course – Fresh Spring Rolls with Peanut Dip. 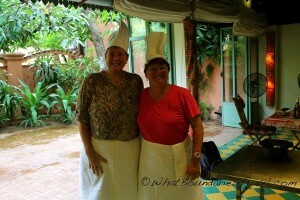 Here we learned to caramelize palm sugar to create a peanut sauce that was drool-worthy. The herbs, garlic oil and fresh vegetables combined perfectly with the lightly fried shrimp to make a very pleasing-to-the-eye dish. 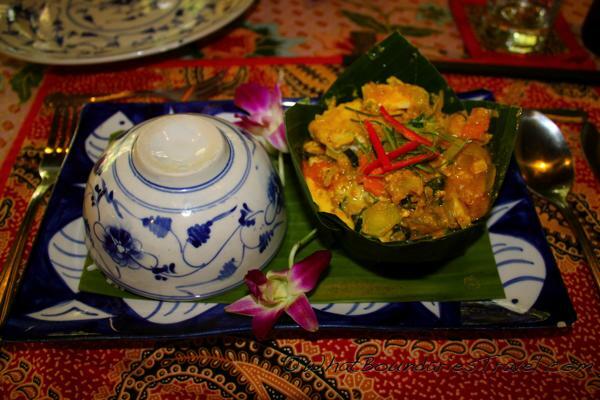 Second Course – Khmer Amok Fish. Since Cheryl doesn’t eat seafood, she opted to give me her fish and make this and the spring rolls a vegetarian dish. That’s okay, more fish/shrimp for me! This is a traditional local Cambodian dish and the smells from the wok as the lemongrass, kaffir lime, and amok leaves simmer are simply amazing. When the chili oil, garlic and coconut milk were added, our mouths started to water. The finished product was then ladled into a banana leaf bowl with lotus flower leaves for presentation. Dessert Course – Fried Banana with Honey Passion Fruit Coulis. Even though by this time we were absolutely STUFFED, we couldn’t resist the temptation of such a fabulous dessert. 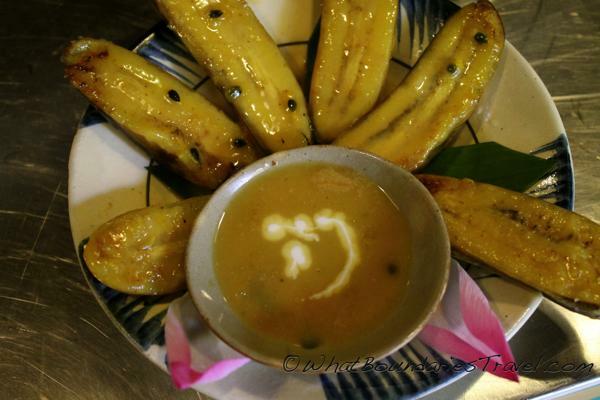 The tiny sugar bananas we used were fried gently in the wok with butter, adding coconut milk, honey, and fresh passion fruit. Now the smells in the cottage were even more delicious. So now comes the moment of truth. The kitchen smells were heavenly. 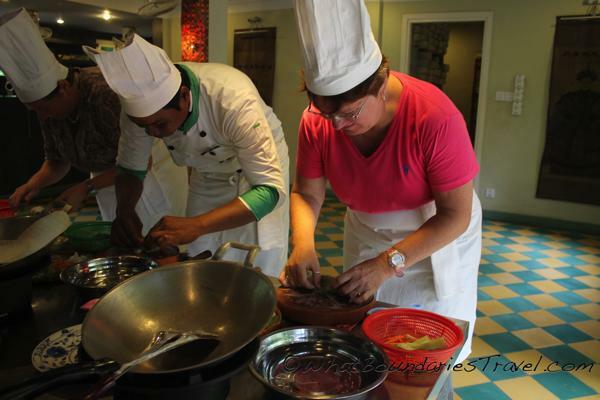 Our creations were beautifully plated and decorated with fruits we cut ourselves, but how did it taste? One word – YUM! We waddled home, but smiling the whole time and carrying back a little bit of Cambodia with us in the homemade basket of spices, recipe book and certificate of our completion of the Champey Cooking School! Method: 1. Cut ripe banana in half lengthwise, set aside. 2. Heat the wok. Add butter, then fry bananas until golden in color. Once golden and soft, add honey, coconut milk and passion fruit. Heat together until syrupy. 3. 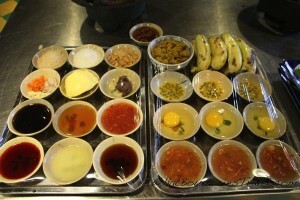 Serve bananas on plate, place syrup coulis in dish and add small amount of coconut milk for color. HOPE YOU ENJOY!